Dr. Eliseo J. Pérez-Stable, director of the National Institute on Minority Health and Health Disparities, gives his Howard University Health Disparities Research Summit presentation on tobacco-related health disparities by race and ethnicity. According to Dr. Pérez-Stable, lung cancer remains one of the most under supported cancers in terms of research and funding, although the disparities remain. “We’re not done, but we’ve certainly made huge improvements over the last 30 years in tobacco studies. Now we are really looking forward to advancing this field with your help as scientists,” Dr. Pérez-Stable said in closing. From Dr. Pérez-Stable’s call urging more minority scientists into the field of tobacco studies, to resources provided to support minority health investigators, Summit participants heard a presentation focused on NIMHD funding and training opportunities given by NIMHD program director Dr. Derrick Tabor. “The point of my presentation was to bring attention to some of the new and underutilized resources NIMHD has for researchers, with an emphasis on NIMHD program officials being the best possible human resources for those looking to attain a grant,” said Dr. Tabor. Dr. Tabor stated that outreach such as this, at the university level, allows NIMHD to engage with the research community as well as learn about researchers’ interests and needs. 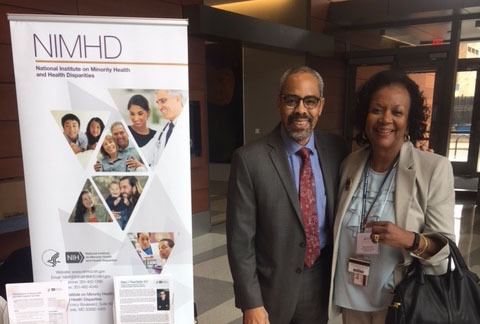 Dr. Derrick Tabor, program director at the National Institute on Minority Health and Health Disparities, and Howard University Hospital’s Dr. Renee Jenkins during the Howard University Health Disparities Research Summit, where NIMHD presented funding opportunities and research on tobacco-related health disparities. Trinidad, D. R., Pérez-Stable, E. J., Messer, K., White, M. M., & Pierce, J. P. (2010). Menthol cigarettes and smoking cessation among racial/ethnic groups in the United States. Addiction, 105: 84–94. doi: 10.1111/j.1360-0443.2010. 03187.x. Pérez-Stable EJ, Benowitz NL, Herrera B, Jacob P. Nicotine metabolism and intake in black and white smokers. JAMA 1998; 280:152-156. Soulakova, J. N., & Danczak, R. R. (2017). Impact of menthol smoking on nicotine dependence for diverse racial/ethnic groups of daily smokers. Healthcare, 5(1): 2. doi: 10.3390/healthcare5010002. Click here to see the agenda from this event.